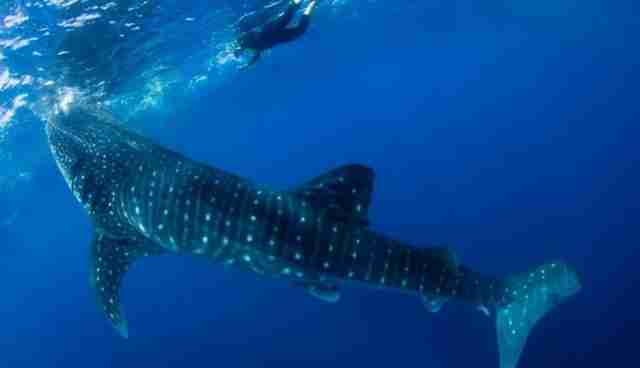 We spent four days swimming with magnificent whale sharks, the biggest shark species in the world. 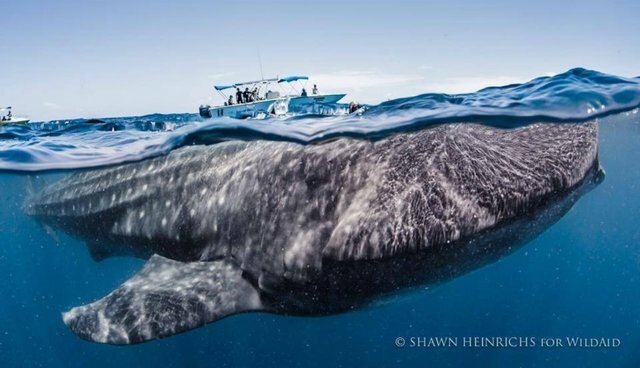 During our time in Isla Mujeres, Mexico with WildAid, we learned how sharks, mantas, rhinos, elephants, and tigers are being exterminated--those who kill them, those who sell them, and those who consume or display them. WildAid's approach is this: "When the buying stops, the killing can too." And thus, when restaurant consumers in China became aware of what that flavorless bit of cartilage in their soup came from, many stopped ordering shark fin soup and consumption fell about 70%. In Isla Mujeres, sharks were once hunted and their fins displayed in restaurant windows. Now they are strictly protected. The fishermen who once caught sharks now take tourists out to see them. Sharks here and in other places in the world are worth millions in eco-tourism revenue. 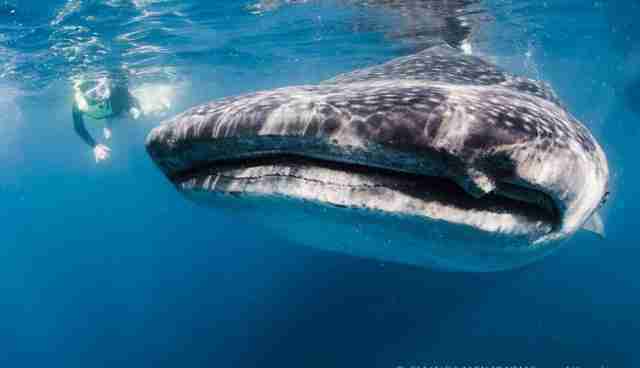 Off to Isla Mujeres in Mexico to swim with gigantic whale sharks. 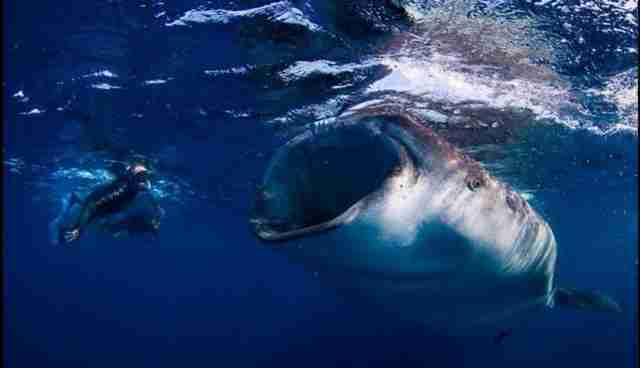 On my last swim, I was eye-to-eye with the whale shark the entire time. I breathed calmly and the shark swam slowly while looking at me. When I slowed, it did as well. We seemed to swim like this for a long time. When I finally tired and stopped, it stopped and looked at me, and when I lifted my head above the water, it smoothly turned away and swam off. It was one of those moments of connection when you realize that an animal is truly a sentient being. I do not think I am anthropomorphizing in saying that the shark could sense through my calm that I was not a danger. Earlier in the trip, I had to work hard on not hyperventilating with my mask on. When you take many quick inhalations and do not expel air completely, carbon dioxide builds up and then it becomes harder to inhale oxygen, resulting in a choking feeling. To stay relaxed, I would sing two lines of a song, exhaling completely in doing so, before I took my next breath. The song I chose was a Spanish love song I learned years ago in junior high, "Sabor a Mi." I was amazed I could still remember it. Later I sang it on board our boat to our two Mexican crew. We then listened to other love songs one of the crew had on his cell phone. 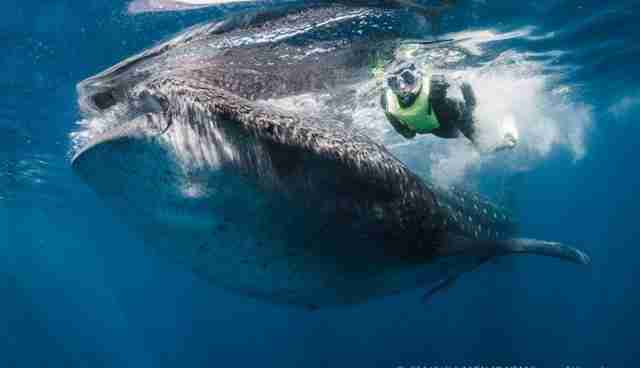 Proof that whale sharks and humans are sentient beings together through music. Shawn Heinrichs for WildAid About WildAid: WildAid is the only organization to focus on reducing the demand for wildlife products with the strong and simple message: when the buying stops, the killing can too. WildAid works with Asian and Western celebrities and business leaders to dissuade people from purchasing wildlife products via public service announcements and educational initiatives, reaching up to one billion people per week in China alone.